March 15th, 2015 the first Scavenge took place at Coogee Beach. What I had thought would be a one-off event of good vibes and beach cleaning action with friends and family has rolled into a full-fledged community marine debris awareness opportunity… and a full-time job. 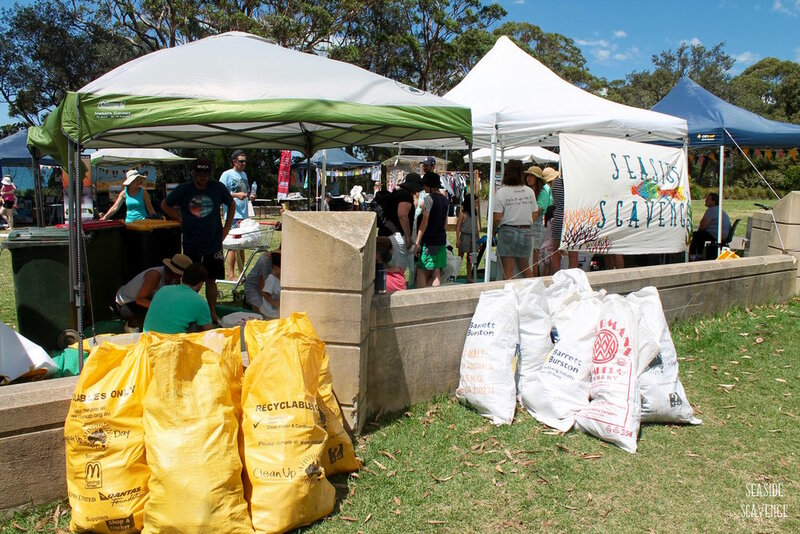 3 years down the track, we just hosted our 30th Scavenge in Huskisson, Jervis Bay. The scale of Saturday’s Scavenge is a demonstration of how far we’ve come, and just how one idea, when nurtured by many, can grow into amazing things. 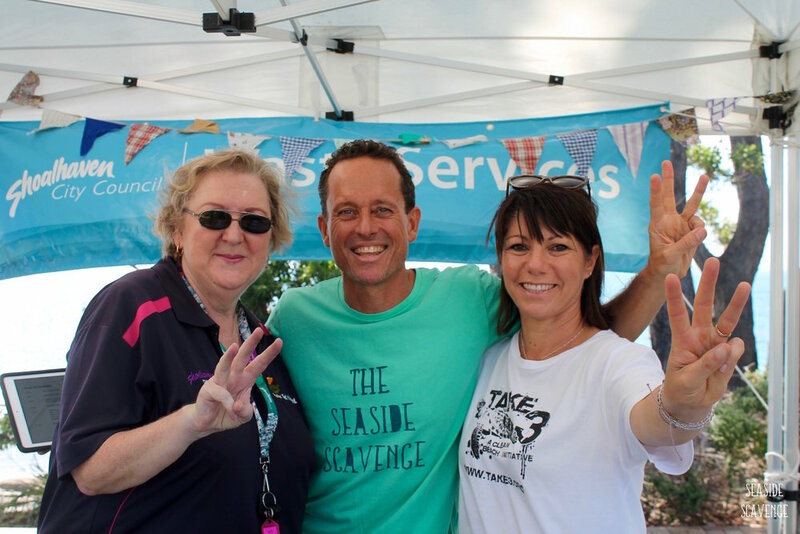 Seaside Scavenge has diversified into running corporate clean-ups, hosting community Scavenges and has joined forces with Boomerang Bags and Plastic-Pollution Solutions to create the Travelling Trash Troupe program. Thanks to Shoalhaven City Council, and the unending support of Transition Shoalhaven’s Judie Dean, we rolled out a film screening of Blue at the Husky Picture Theatre which 170 people attended, 5 primary school presentations across the Bay, a Boomerang Bags Sew-A-Thon and gathering and a Seaside Scavenge. All were invited to host a stall, and even the local radio station Bay N Basin 92.7FM broadcast live from the Scavenge, spreading the toe-tapping live tunes of local artists Ryan Ferry, Bella Pakes, Joe Visser and Hans Kleft far and wide. We had more than 200kg of pre-loved stuff donated and collected by LeAnn Hanson at Huskisson Primary School. 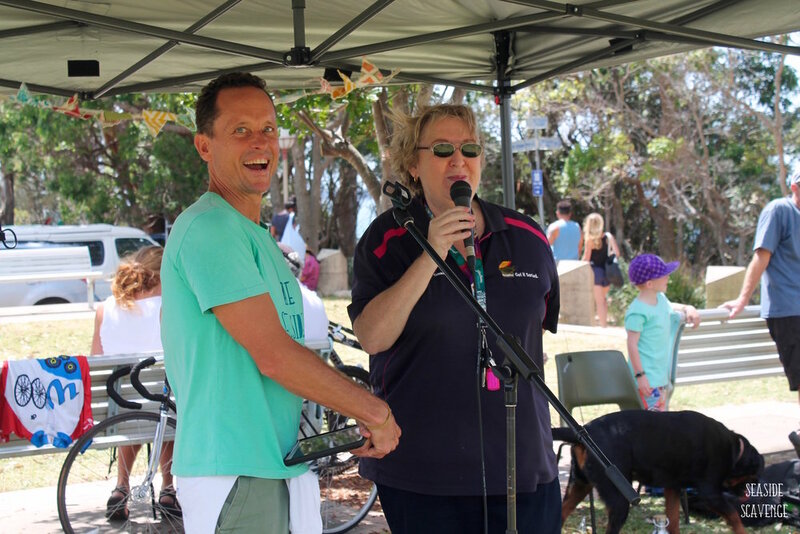 Prizes from Club Husky, Trees Adventure, Huskisson Yoga, Vincentia Butcher, the Maritime Museum, Dolphin Watch Cruises and Jervis Bay Kayak & Paddlesports were sources of inspiration. In addition, we had 100 beers from the Huskisson Hotel, ice creams from Simons Gelato Truck and pasta from Teresa’s Trattoria Food Van all on sale with litter currency. We managed to keep the Scavenge zero-waste even with food vans! The Crockery Library stocked with bowls, cups and cutlery from the Community Centre and Wash-Up Station emanated the wider plastic-free pledge message that local cafés; 5 Little Pigs, Nutmeg Café, Main Deck Café, Pilgrims and Foodies Delight, had taken for the day. And it didn’t stop there. We had the Huskisson Drumming Group host a workshop, Bonnie Cassen run an Earth Healing Meditation, a display of paintings of the Bhewerre Wetlands at Sanctuary Point from local artist Vanessa Barbay, the bike powered generator with a second-hand battery from Jervis Bay Automotive and the plastic-bottle greenhouse built by the Mens Shed and converted into our pop-up market change room. The King & Queen of Green even joined us for the day! Evidently there was an impressive number of hands that contributed in pulling off last Saturday’s Scavenge. We successfully engaged 169 people across the community, 89% of whom had never attended a clean-up, to assist in removing 203.8kg of litter including 4,058 butts, 974 glass bottles and 1,696 pieces of soft plastic packaging. Seaside Scavenge has now removed 6,009kg of litter and 103,536 butts from the environment and redistributed 4,148kg of pre-loved stuff with the help of more than 3,000 people from 20 communities across the East-Coast, 90% of whom had never attended a clean-up previously. For me the Scavenge is much more than stats. It’s a platform to inspire individuals to take a stand against single-use plastics and the fast-fashion industry, but more importantly an opportunity to connect with others about the future of our ocean and see the potential of the individual to do anything they set their mind too! I am committed to connecting the hands and hearts of communities through the Scavenge and bring the environment to the forefront of our conscious. It’s clearly something that can be strengthened by the support of many, so don’t miss out on the next 30 Scavenges and get in touch to get on board. Port Macquarie Chapter & First Generation Scavengers to Be!